These happy occupants of an Arizona Park model community are probably perversely enjoying the news of the latest blizzard to hit the Midwest. 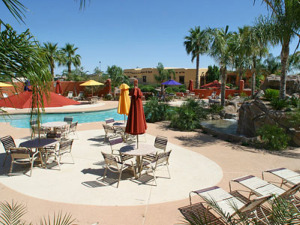 Much of the community activity, centers around the use of the various swimming pools and hot tubs that almost all of these active living communities contain. If you've never played volleyball in a swimming pool, you will have that opportunity if you choose to live like these folks live. 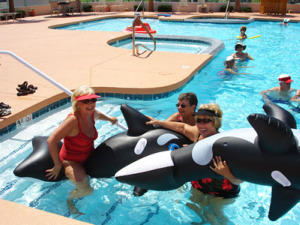 In some parks it is a daily ritual to meet at the pool at say 2 PM for the the daily water volleyball game... you don't have to be too close to the pool to hear the laughter and sounds of people having a truly great time. It is easy to see that some park model residents look at their community as a country club, without the country club costs. When you spread amenities, over 100 to 2000 family units, you get the economies of scale that would make access to these activities difficult if not impossible if you tried to do it yourself. Champagne living on a beer budget is very doable in these fun communities. A park model community, is it for you? I would be willing to wager that you'll never hear about park model living from your financial planner... let me know if I'm wrong. A great way to see if you would fit in in such a community, is to try it before you buy. To found out how you can experience this lifestyle, whether you have an RV, or are interested in trying park model living, rent one,for very little money you can determine if this is something you want to do, or conversely it may keep you from making a mistake that you regret later. If you are looking for a more quiet and sedentary lifestyle, you can use this rental time to see if this park is for you... or if not visit other parks in the area into you find the perfect place to live. Some of the parks, or combination of parks, are so big that they can offer top-of-the-line entertainment, for a ticket price of course... Marie Osmond appeared last year and Kenny G is scheduled to appear this year. How do you say Branson West?